Hanti, the domestic wolf, feels at ease when walked by her master in the Russian city of Smolensk. She is also a center of attention for residents. Living in an animal shelter, the “pet” is befriended by other dogs and even a big ginger cat. Two baby wolves - one male and one female – joined the shelter in Smolensk, 360 kilometers (220 miles) west of Moscow, last summer, when local hunters brought them from a forest. They were little and shaking, as well as scared of people. It’s believed that their mother died of injuries after fighting. The female cub, named Hanti, and the male cub, named Larson, were brought up alongside dogs and even a cat. He says Hanti should be awarded for her patience and friendship with a cat. “She realized that the cat is ours and she can’t touch it,” he said. 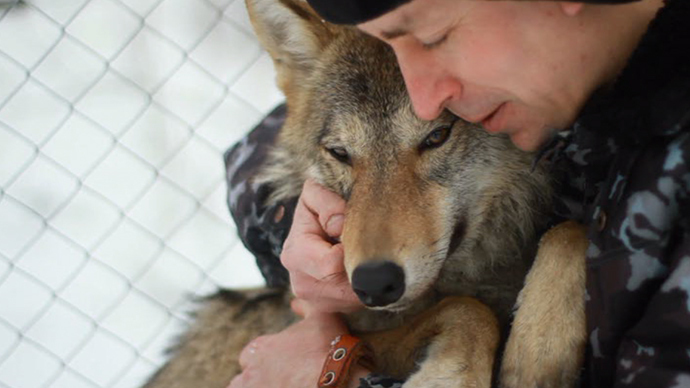 The first days in the shelter were not easy for both wolves, Samoylov said. Not all dogs welcomed their new neighbors, but one of the dogs even managed to feed them – when Larson and Hanti arrived, one of the dogs was suckling her own young. Unfortunately, Larson died soon after arriving, and Hanti was left alone. She transformed from a small pup into a real savage beauty. She was able to understand simple commands. But sometimes Hanti howled in the evening, recalling her life in the wild, Samoylov said. Now, eight months after Hanti joined the shelter, he said that sending her to a Moscow zoo was out of the question. Still keeping her wolf habits, Hanti obeys typical dog commands such as sit, stay or holding out a paw. Hanti can signal if she is uncomfortable and wants to go home. Despite being a friendly wolf, Hanti is walked with a muzzle, as despite all her charm she is still a savage animal.